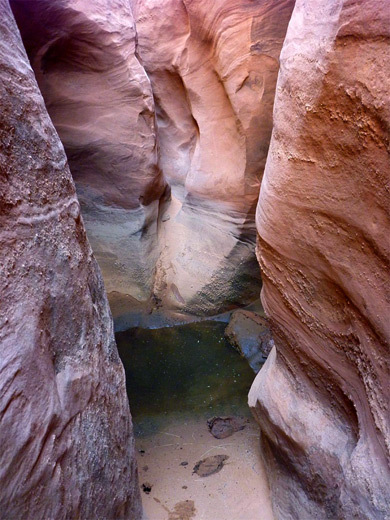 Trachyte Creek and its branched tributaries form many slot canyons, all surrounded by the undulating orange Navajo sandstone slickrock typical of this desert region, along the north shores of upper Lake Powell. Maidenwater is one of the longer tributaries, and a side canyon joining shortly before the Trachyte junction has one such narrows section; short but quite pretty, sloping downwards fairly steeply, interrupted by chokestones and dryfalls. 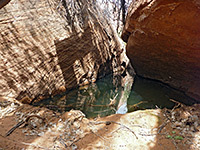 The slot empties into a brush-filled lower gorge, which is joined by a tiny ravine on the north side, also containing some narrow passages. The canyon could be explored as part of an all-day trip visiting some of the longer Trachyte canyons, especially those on the east side, but to see just this place - known as the North Fork of Maidenwater Canyon - needs about three hours. TopoQuest topographic map of the canyon. The North Fork canyon is reached by UT 276 to Bullfrog. One possible start point is from the signposted parking area at Maidenwater Spring, near milepost 9; from here, the upper end of the drainage is 1.4 miles cross country, walking east then a little south, initially over uneven terrain of small gullies and hills, then across flatter, sandy ground. An alternative approach is from half a mile north on the highway, along a faint vehicle track that heads east over grassy flats, coming close to the drainage after 1.7 miles. 11 views of the canyon. 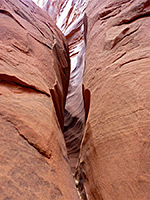 The uppermost part of the drainage is enclosed by steep slickrock, sloping down to a shallow slot that offers several entry points. 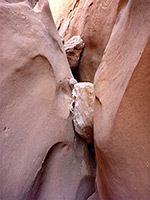 The canyon is narrow though never very deep or dark, lacking any undulating cliffs or twisting rock formations, enclosed instead by smooth walls that rise up to form the sides of sandstone domes. The floor drops frequently, in steps of 5 to 15 feet over falls and chokestones, and often the passages are very narrow at the base, so progress is by stemming a little way above. Several bigger falls need quite difficult downclimbing, before the narrows end abruptly, replaced by a shallow, overgrown box canyon, filled with reeds, bushes and cottonwood trees, containing a few deep residual pools. 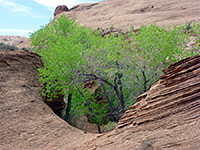 The obstacles can be bypassed if necessary by exiting the canyon and walking over the steep slickrock on either side, then re-entering downstream. A short tributary joins from the north, leading to a circular chamber, with a much narrower slot above.